When most people think of an amusement park, thoughts turn towards giant spinning wheels, big tents, and maybe a roller coaster. But apparently to Ukraine and China, an amusement park is actually a thousand-foot long aircraft carrier. In 1998, the Admiral Kuznetsov-class aircraft carrier Varyag was sold to China for use as an amusement park. A precedent had been set, as China had also purchased the Kiev and set it up as a floating hotel. So when Chong Lot Travel Agency won the auction of the Varyag with a bid of $20 million, most thought that the Varyag would end up as some sort of floating attraction in China. Instead, though, the ship went to the shipyard at Dalian in June 2005, where a major reworking began. With a planned sale of Sukhoi Su-33 naval fighters, the idea that the former Varyag would become a floating hotel or casino faded away, and it became apparent that China intended to rebuild the vessel and sail it as their first aircraft carrier. It was not until June 2011 that China finally admitted that they were building an aircraft carrier, and stated that this refurbished Russian ship would be used for training and as a pattern for an indigenous aircraft carrier design. The ship is expected to be handed over to the Chinese Navy sometime in 2012. As the original is an Admiral Kuznetsov-class aircraft carrier, it is not surprising to see Trumpeter come out with a kit of the PLA Navy Aircraft Carrier, as they did the Kuznetsov several years ago. In fact, this kit is pretty much identical to that original release, with just some changes and improvements to the island and the inclusion of a small fret of photoetch. 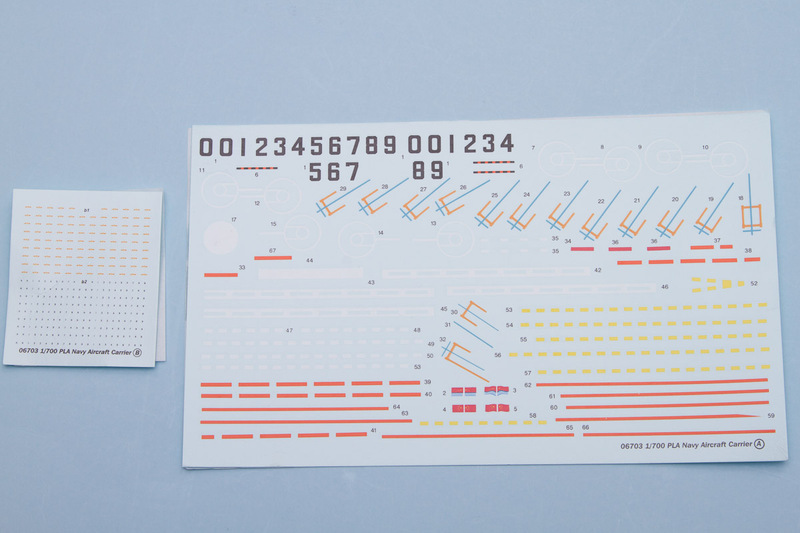 The decals are extensive, and like the original, the kit comes as either a full hull or waterline version. 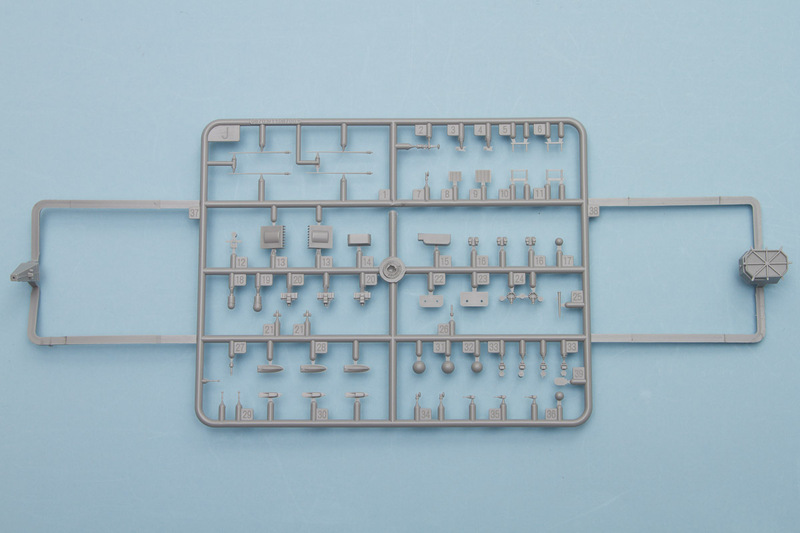 As nearly all the plastic and the assembly procedure is identical to the original release, I'll refer you to our review of the Kuznetsov kit and just focus on what's new in this kit. Starting with the photoetch fret, this is a small set, but it provides some very useful parts. The whip aerials on the side of the flight deck are replaced by photoetch, which will result in a much more scale appearance. The rest of the photoetch focuses on various antennae found on the island. These are ideal for photoetch, as they invariably feature fine grids that are impossible to replicate realistically in injection plastic. For the island, the original kit was nicely engineered to eliminate seams, but this new kit is even better. Utilizing what appear to be slide molds, the new island assembly is greatly simplified. The main island assembly is made up from three parts, as opposed to the twelve in the original kit. 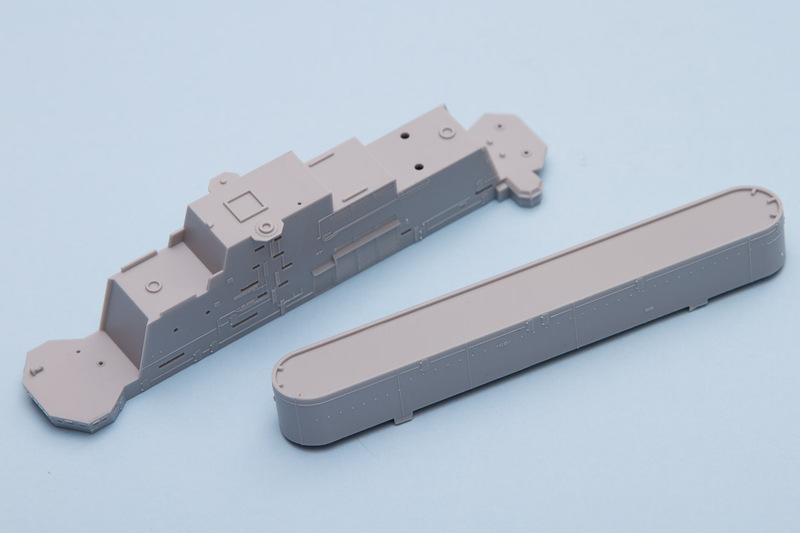 The island is a different shape and features a different antenna configuration, so don't think you can buy this kit and build up a Russian Kuznetsov-class carrier. The simplified construction continues with those various antennae, which include several domes as well as a tall pillar with several antenna sets on top. The aircraft complement is slightly different between the two kits as well. While the original Kuznetsov came with Su-33s, MiG-29s, Su-25s, Su-34s, Yak-141s, Ka-27s, La-29s, and Ka-31s (a rather impressive fleet of aircraft), the Chinese version comes with the J-15 (the Chinese improved but visually identical Su-33), the Ka-28 (visually identical to the Ka-27), the Ka-31, and the Z-8. The two Kamov helicopters have the option of folded rotors, and there are enough aircraft provided to build up a suitably busy flight deck, with eight J-15s and eight helicopters. The decals include full deck markings, along with hull numbers. The latter are currently not used on the real ship, but there are enough numbers provided to cover whatever the Chinese decide to number the ship. 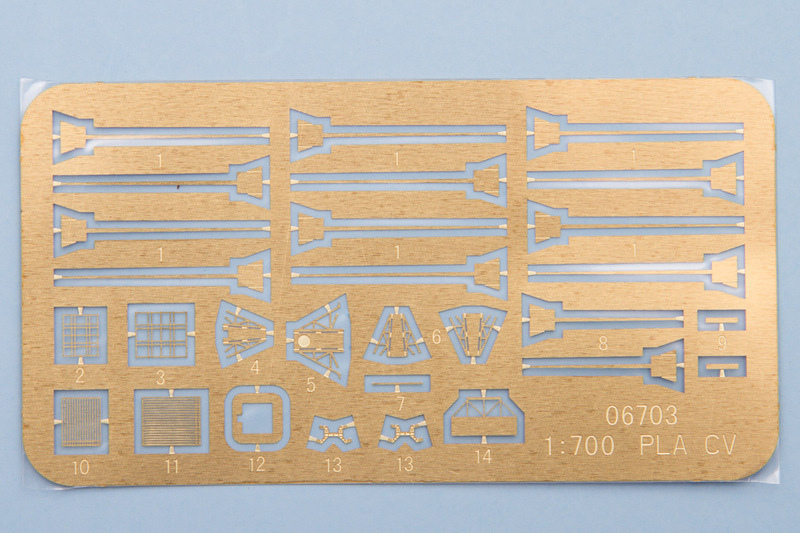 The flight wing comes with Chinese national markings and some small numbers, but the latter I have not seen used on PLAN aircraft. Overall, this is a great reboot of the already good Trumpeter Kuznetsov. If you missed that kit the first time around, here's a chance to build it up as a ship that's undoubtedly going to be in the news for a while yet. My thanks to Stevens International for the review copy.